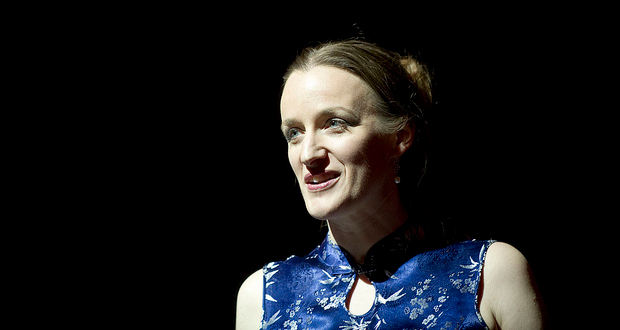 Kate Smurthwaite, best known for debating with idiots on TV and radio, has two shows this year at the Free Fringe. Whereas her evening show, My Professional Opinion, is standup, this afternoon show follows a chat show format. Kate opens with stand up, with appropriate vitriol against Mssrs (an apt homophone) Cameron and Osbourne; it might not be the most original or cleverest material, but it is an effective warm up that establishes the political tone for the hour. With different guests each day, it might not be an efficient use either of our time, dear reader, to dissect a particularly performance. Today, Smurthwaite was joined by comedian Sarah Bennetto, and Gary McLelland, chairman of the Edinburgh Secular Society. Bennetto performed a set about the idiosyncratic niceties of Stoke Newington, while McLelland explained his quest to increase equality by removing religious privilege. The debate is not exactly balanced; it’s the left-wing equivalent of being driven around Hampshire in a taxi by Nigel Farage. The combination of stand-up comedy and political activism is vaguely reminiscent of John Scott’s monthly show, Sod the Tories (And Have a Nice Week), at the Newcastle Stand, shortly to be released as a podcast. Smurthwaite keeps proceedings moving at a good pace, with Bennetto making light-hearted interjections, to make World Inaction an entertaining haven for those subscribing to this political persuasion. The News at Kate 2013: World Inaction runs at The Canons’ Gait, Edinburgh until 25 August. My Professional Opinion, Kate’s stand-up show, runs at Ciao Roma until 24 August.